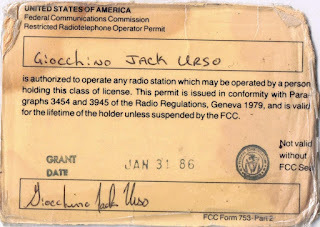 On the evening of June 3, 1989, I was working the overnight shift at WQBK-1300 AM. At the time, the station was located on an isolated hill outside Albany, New York. The networks were buzzing with news of the violent crackdown on the pro-democracy protestors in Tiananmen Square. The teletype clacked away every few minutes with the latest reports. In the days before the World Wide Web, there was little to do but wait for the next report to come through. Looking for more news beyond our network feed, I began to surf the frequencies on the satellite dish. Eventually, I picked up an audio feed of an English-speaking announcer for Radio Beijing who reported the news of the massacre at Tiananmen Square. I’m not sure if this was a part of a network news feed or just a stray signal I caught, but I felt an immediate connection to my fellow broadcaster. It was also obvious to anyone who followed the news that the Communist Chinese government’s response would fall harshly on those who broke the wall of silence. I wondered if I would have the same courage had I been in his place. Knowing the historical significance of the broadcast, I transferred it from reel-to-reel tape to a cart (see Fig. 1). Carts look like 8-track cartridges and come in varying lengths. They were used for playing everything from station IDs and bumpers, to commercials, public service announcements, interviews, and music. 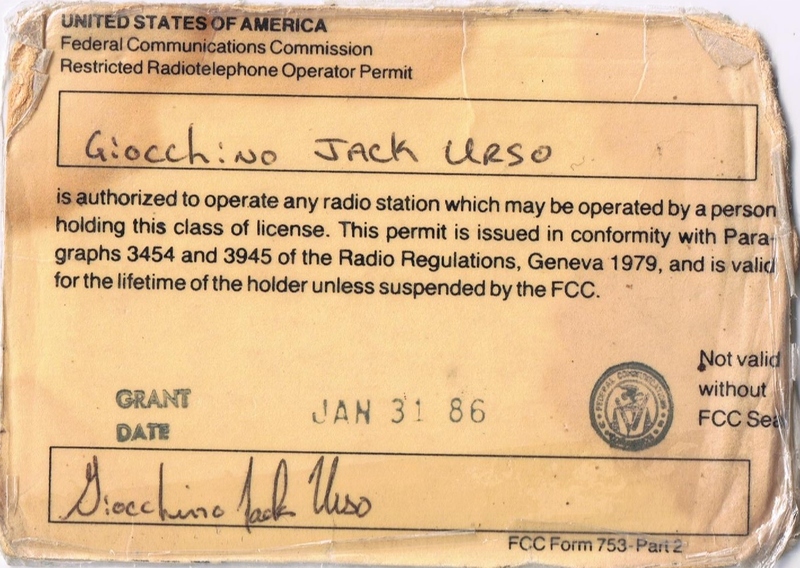 Looking back at the state of radio news gathering in 1989, with no computers or Internet, and only antiquated relics like teletype, carts, and reel-to-reel, I still marvel at how we got any work done. Fig. 1: The cart I recorded the Radio Beijing announcement onto on June 4, 1989. I produced my first report on this broadcast in 2000 while taking a course in Producing Historical Documentaries for Radio with Professor Gerald Zahavi at the University at Albany while working on my master’s degree. The web page for the course, though nearly 12 years old at the time of this writing, is still available at the above link. There, you can find my original short audio documentary, The Lost Voice of Radio Beijing (requires RealPlayer). Professor Zahavi also broadcast my report on his Talking History program on WRPI-90.9 FM, the radio station for the Rensselaer Polytechnic Institute, in 2000 and 2001. This is Radio Beijing. Please remember June the third, 1989. The most tragic event happened in the Chinese capital, Beijing. Thousands of people, most of them innocent civilians, were killed by fully armed soldiers when they forced their way into the city. Among the killed are our colleagues at Radio Beijing. The soldiers were riding on armored vehicles and used machine guns against thousands of local residents and students who tried to block their way. When the army convoys made a breakthrough, soldiers continued to spray their bullets indiscriminately at crowds in the street. Eyewitnesses say some armored vehicles even crushed foot soldiers who hesitated in front of the resisting civilians. Radio Beijing English Department deeply mourns those died in the tragic incident and appeals to all its listeners to join our protest for the gross violation of human rights and the most barbarous suppression of the people. Because of this abnormal situation here in Beijing, there is no other news we could bring you. We sincerely ask for your understanding and thank you for joining us at this most tragic moment. While working on the report for the class, I contacted Radio Free Asia in Washington D.C. in the hope that someone there might have some information about the announcer. Through an interpreter, I was able to speak with a former Radio Beijing reporter who was actually at Tiananmen Square the evening of June 3, 1989. She didn’t know who the announcer was, but said she would look into it and let me know if she found out anything. Fig. 3: Human Rights Watch listing. Recent research confirmed my contact’s report of Wu Xiaoyong in the document, The Persecution of Human Rights Monitors: December 1988 to December 1989, by Human Rights Watch (December 1989) (see Fig. 3). The eventual fate of the announcer Yuan Neng is not reported. China is seeking a balance between its capitalist ambitions and cultural traditions; however, one wonders if the threat the Chinese Communist government perceived in 1989 was not so much a fear of revolution per se, but rather that the moral imperative through which all governments derive their power, the consent of the people, would vanish in the face of true competition in the marketplace of ideas. In 1988, my mother, an inveterate book collector, gave me a couple boxes of old books – odds and ends she had picked up while living in Delhi, New York. A housekeeper in a rural community, she accepted payment in a variety of ways, including eggs, hay, and old books, among many other things. I didn’t have the shelf space, but being a lover of books myself, I figured one day I would get through them. I put the box in a closet and promptly forgot about them. I am very sorry to inform you that Mothers dead she died within a few days illness, and Thank God she is in Heaven among the Blest, She was 2 years with me and she was very helpless she could not do nothing for herself. You can access the street view on Google Maps by clicking here. Today, it is home to the shop of Robert Pringle, butcher, on the first floor. It is in that building, on one of the upper floors, that Rechel Miller took care of her ailing mother until she crossed "the cold river of death." 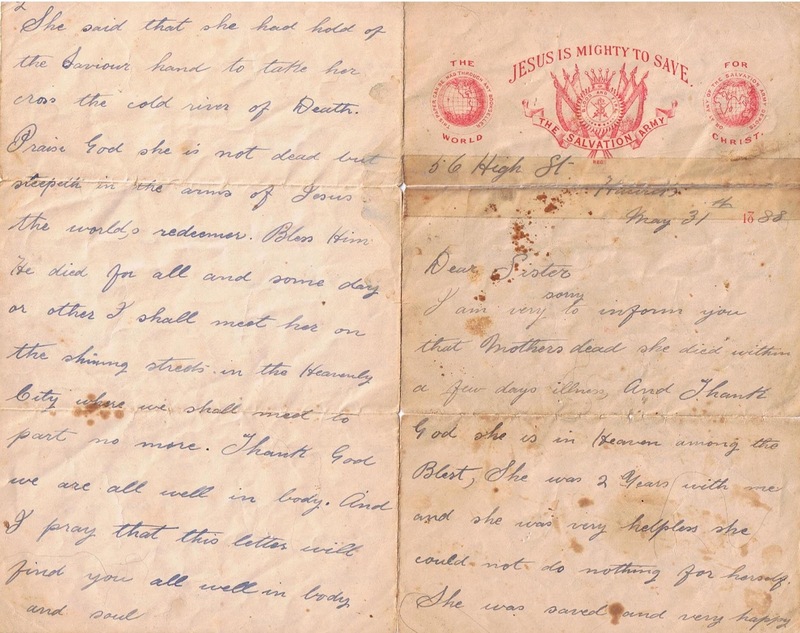 The two women referred to in the letter – Christiana and Astratia, who have not been heard from in many years – are these Rechel's other sisters? One can only guess. The news that Christiana has not been heard from in over 20 years could mean that she emigrated herself to some far-distant land, succumbed to illness, or perhaps holds a deep-seated grudge that compelled her to leave Hawick all those years ago. 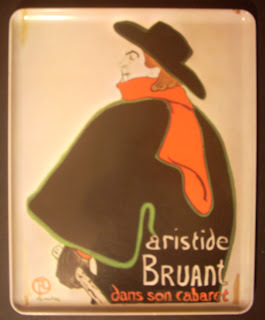 One cannot resist a little speculation with such a historical fragment. There is so much written between the lines that will forever remain unknown, including the likely recipient of Rechel's letter in America. With her mother recently passed, and two other likely family members gone without a word, I imagine Rechel Miller may have felt quite alone that May of 1888. My research uncovered genealogy forums in which I discovered that a Miller family from Hawick, Scotland emigrated to the Catskill Mountains in New York State’s Delaware County, where Delhi is located and where my mother was living when she obtained the book that contained the letter. Therefore, it seems logical that Rechel Miller is likely related to that branch. 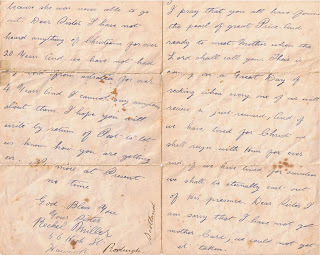 The surname Miller, however, is quite common in Scotland and I found references to a Rachel Miller and a Retchel Miller from around the same time period in Hawick, but alas nothing definitive to connect Rechel Miller to any of them. It may simply be that more than one Miller family, unrelated to each other, emigrated from Hawick to Delaware County in the 19th Century and her family’s history is now lost to time. 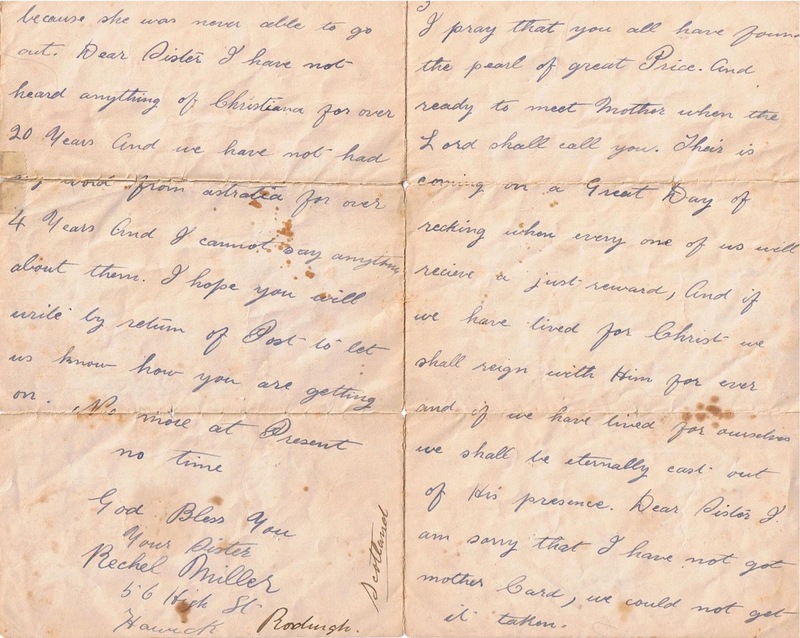 Rechel Miller’s letter does give us a valuable look at the patterns of human migration and the burden left on the families who remained in the country of their birth. What we can tell from her handwriting is that she has a firm, strong hand, likely a woman in the prime of life, and with a decidedly religious bent. Her cursive is very good, but marked by noticeable grammatical and spelling errors, suggesting a formal, though limited education. Rechel’s burden in caring for her invalid mother must have been great indeed. Speaking from personal experience, taking care of an infirmed parent is a challenge in the 21st Century and one can only imagine the financial and emotional burden Rechel had to carry alone, without the assistance of health insurance and social service or siblings to help share the load. Emigration often leads to a better life for the people who take the chance, but for those who remain, without the support of those relatives who left, the impact would likely have increased financial burdens and family responsibilities while reducing their personal wealth and expectations of care and comfort in their own old age. At a time when senior services were virtually unknown, the elderly generally remained with their children or siblings, if they were lucky – and many were not. 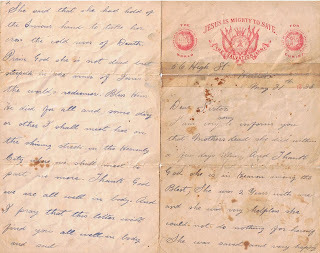 With her sisters gone and mother now deceased, who would take care of Rechel in her own senior years must have weighed heavily on her mind at the time she wrote this letter. Her reference to “we” in the letter suggests Rechel was not alone, and I do hope she passed her years in the warmth and security of the love only family can share.